The Tomahawk Aviation F-104 Starfighter , after more than three years development and introduction of a high-quality level mass-production line , this model will come to the market in 2020 . Some insiders know that there are a three pre-series models which are manufactured by experienced modellers , we used this models to optimize the plane and make it ready to be a real Tomahawk plane at high level standards .One of thoe models is now for sale because we have finished the development phase and are now working on setting up the mass-production line. One nice feature is that the fuselage comes in three parts so that the plane fits in a normal SUV or Van. The model is fully built and painted , ready to ply except of turbine and battery , it was flown a few times to test it's performance. 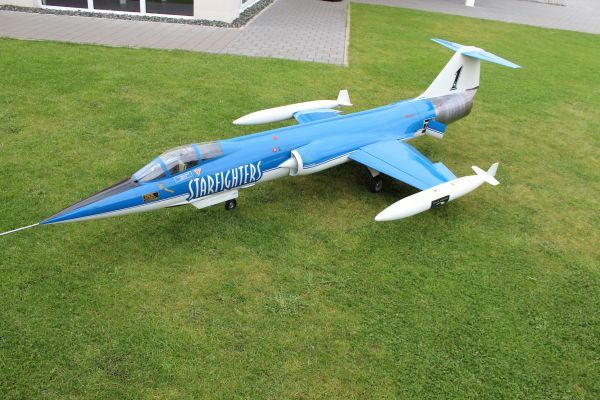 Related links to "F-104 Starfighter fully built and painted ( pre-series model)"